Following the much-heralded publication of The Letters of Ernest Hemingway, Volume I: 1907-1922, the deluxe leather-bound edition was finally released on November 4. Limited to 500 volumes, the orders exceeded that number before the day of publication. The final binding of these books took place in the mountains of east Tennessee: an area as famous for Daniel Boone as for its book binders. At Kingsport Book, the latest of several generations of local craftsmen still ply their trade in a niche activity that so far is unthreatened by electronic publishing. “We could not find the skills we needed anywhere else,” said Fred Cooper, the company’s CEO. Ongoing commissions include the keepsake editions of The Easton Press. 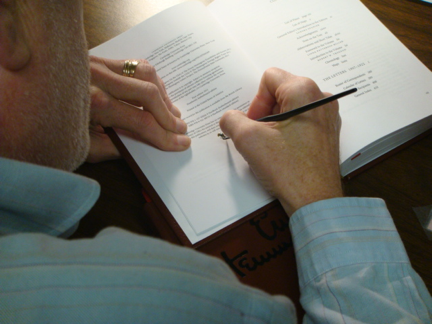 For signed editions, Kingsport ships the completed books to a less remote site for inscription or binds signature pages into the finished book. In the case of the deluxe Hemingway edition, there was not a signer but there was a calligrapher to individually number each volume. While not a thriving occupation in twenty-first century America, a professional calligrapher was found, not too surprisingly, in the Kingsport area: Pat Whisnant, a former teacher and musician whose usual commissions involved decoratively lettered announcements for special occasions. 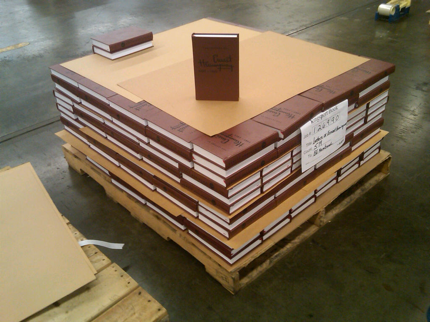 The Hemingway books themselves were waiting, looking sharp in their new leather bindings. The calligrapher began numbering the books with a traditional fountain pen, which meant they had to be laid out with pages propped open briefly to allow the ink to dry. They were then laid on a series of carts in sequential order. A tiny number of overruns allowed for only the slightest margin of error. 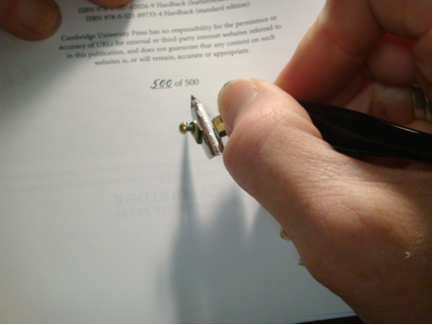 Ten minutes after the numbering began, an upset inkwell closed that margin, and for the next seven hours of signing no one breathed as the pen and ink made contact with the remaining pages. The numbering completed, each book was shrink-wrapped and given a label with title, bar code, and the unique book number. The meticulous process was rewarded when a misprinted label was found. A corrected replacement was emailed from NYC, printed, and inserted in the right sequence of the assembly. 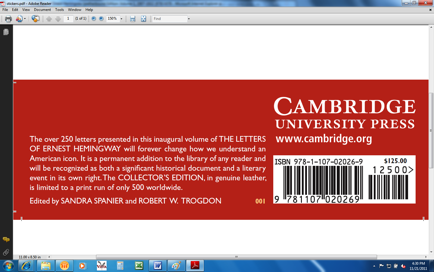 @HemingwayLetter tweeted the progress of the numbering and labeling throughout the two days. 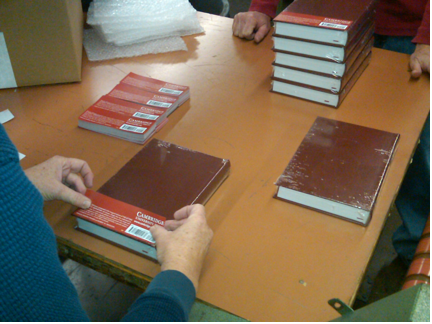 In NYC, the sales and marketing group worked with West Nyack to get ready for the actual delivery of the books to the customers and individuals who had ordered or been promised them. A final mishap—less threatening to the project than the spilled inkwell but more of a crisis, overall—added one more drama to the saga of the deluxe Letters of Ernest Hemingway: the great Halloween weekend snow storm! It downed trees and power lines in the Northeast and knocked West Nyack out of operation for almost a week. When the lights came back up, the leather-bound letters went out, only slightly delayed, and going by the feedback of everyone who has seen a copy, the wait was worth it. Appropriately, Number 1 of 500 went to Patrick Hemingway, the author’s son and a great supporter of the project from its inception. 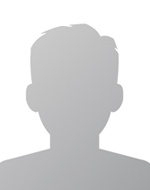 About the Author: Tom W.